This incident from Jan. 26 illustrates the conditions officers were working under over eight days of intense winter weather, which ranged from wind chills approaching 40 degrees below zero to blizzard conditions that forced the closure of a section of more than one of the Upper Peninsula’s major highways. What follows is a review of several of the reported incidents statewide. Seven conservation officers assisted the Marquette County Sheriff’s Office in the search for a missing 25-year old Northern Michigan University student who had traveled to the Yellow Dog River to hike and take photographs Jan. 24. Numerous agencies were involved in the search effort. Conditions were extreme as daytime temperatures hovered around -4 degrees and -22 degrees at night. Tragically, the student was found deceased by volunteer searchers three days later. It appeared he had gotten disorientated during a snowstorm and succumbed to the elements. CO Johnathan Kamps assisted with a vehicle that was stuck in a ditch in Marquette County. To ensure the passengers’ safety due to the minus 10-degree temperatures, Kamps waited until a tow truck was able to remove the vehicle. On Jan. 26, CO Cody Smith was heading to assist with the search and rescue efforts at the Yellow Dog River when he came upon a pickup truck that had hit black ice and spun into a ditch. Smith ensured that the occupants were unharmed and warm while waiting for a tow truck. Smith directed traffic while the vehicle was recovered from the ditch. Air temperature was -17 degrees. CO Jared Ferguson received a call late in the evening from a fellow state employee who was stuck in a ditch between Harvey and Munising. The Michigan Department of Environmental Quality employee had been unable to contact any help. He had Ferguson’s cell phone number in his phone from a case they worked together six years prior. Ferguson was able to arrange for someone to quickly go to assist, due to the extreme temperatures. While patrolling Baraga County at about 3 a.m., along a remote stretch of US-41, Conservation Officer Josh Boudreaux came across a vehicle parked on the side of the highway. Boudreaux approached the vehicle, which wasn’t running, and noticed it was unoccupied but still in drive with its headlights on. Seeing this as odd, Boudreaux attempted to locate contact info for the registered owner of the vehicle, but the car was a Wisconsin rental. While attempting to contact rental companies, a vehicle pulled up and dropped off the driver of the car, who said she had run out of gas while driving home from a concert. She was worried she was going to have to stay the night in her car. Boudreaux helped refuel her vehicle and was about to leave when she flagged him down, stating her car wouldn’t start. Boudreaux pulled his truck around and jump-started the battery. Boudreaux followed the thankful driver to the next gas station to ensure she didn’t have any further issues along the way. CO David Miller was on patrol in Baraga County when he encountered a stranded motorist on Bayshore Drive whose vehicle would not start. Miller was able to jump-start the stranded vehicle and safely get the motorist on their way. While on patrol in Menominee County, Conservation Officer Jeremy Sergey and Probationary Conservation Officer Noah Thompson responded to a single vehicle crash on US-41 near Willow Road. When the officers arrived, they saw the vehicle had left the highway, went through a guard rail and traveled approximately 100 yards before crashing into a tree. The driver of the vehicle had several deep lacerations to each of his hands. The officers rendered first aid until EMS arrived. CO Zach Painter received reports of a roughly 70-year-old snowmobiler who had gotten separated from his group earlier that day on Lake Gogebic and could not be located. Painter was notified early in the afternoon and responded to Bergland where the subject had been seen earlier in the day. Painter located the man, uninjured, at a local bar, looking for his group. CO Painter was on patrol in Gogebic County during white-out conditions when he located a car stopped and partially in the lane of traffic near a busy intersection. The driver could barely see out of her windshield. Painter assisted the motorist in getting into a nearby parking lot where she could wait for the snow to let up. CO Doug Hermanson patrolled Keweenaw County roadways to check for any disabled vehicles in the face of sub-zero weather conditions. A vehicle was located stuck in a lookout area where a family had attempted to turn around. They had been unable to get a cell phone signal to call for help and were attempting to dig snow from underneath the car by hand. Hermanson shoveled the front of the car out and used the patrol truck to ram through and pack down a trail through the lookout. The car was then pushed out with the assistance of the family. COs Justin Vinson and Colton Gelinas responded to a report of a lost 19-year old snowmobiler in northern Chippewa County. 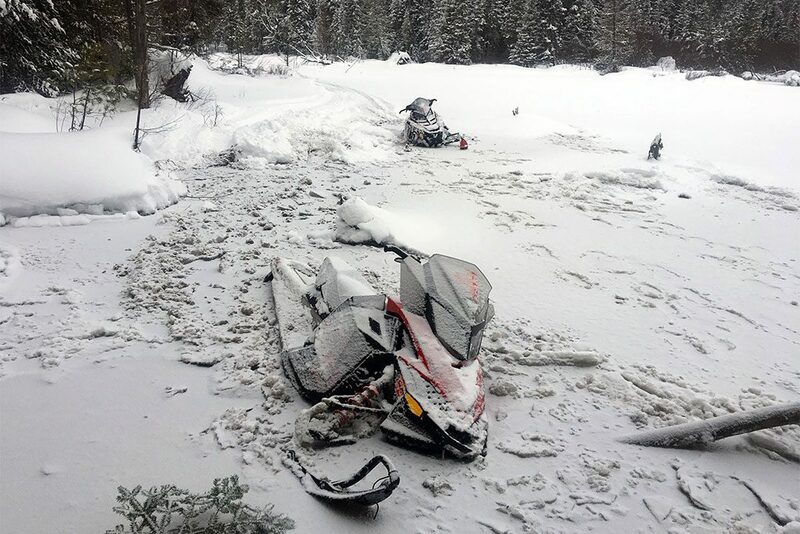 Three snowmobilers had left the Paradise area to ride the snowmobile trails. Their day quickly turned to panic when one of the three snowmobilers went missing. With limited cell phone coverage and frigid temperatures, it became a desperate search for their missing friend. After searching for nearly three hours, the riders decided to call 911 for assistance. The officers quickly loaded their snowmobiles and responded to the last known location of the group. They were able to make telephone contact with the lost snowmobiler. With their thorough knowledge of the area, the COs were able to talk the lost subject back to a trail intersection where he was advised to flag down the next passing snowmobiler. The COs asked the lost subject to lend his phone to the good Samaritan snowmobiler and asked if he could lead the lost snowmobiler back to his friends. The party was soon reunited, just before dark. On Jan. 25, CO Mike Evink and PCO Todd Sumbera were on their way to conduct a patrol on Indian Lake in Schoolcraft County when a call of a missing 7-year-old came over the radio. The two COs were on scene with Manistique public safety within minutes. The girl was found within half an hour. Share the post "DNR conservation officers respond during stormy, cold, wintry weather"
Categories: Featured, Trails, and Upper Peninsula.